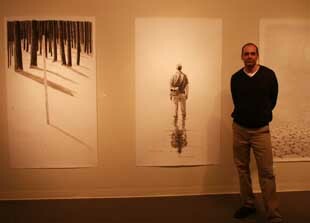 Michael Brophy with some of his sumi ink drawings at Laura Russo Gallery. Fresh off several successful museum shows, a CD cover for Sleater-Kinney and a nice review in Art Forum, Brophy went for something more immediate than paintings this time. Mona Hatoum's anti war poster on PNCA's walls (the painted rectangles by architect Randy Higgins are code for Rimbaud's "Departures"). Artist and gallery staffer Molly Torgeson at Elizabeth Leach Gallery, positioned to protect a Russell Crotty globe from the thousands of wet and occasionally inebriated gallery goers that inevitably come out on First Thursday. 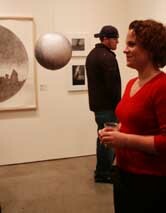 A great show of sculptors who draw including; Miro, Sol LeWitt, Fred Sandbeck, Erwin Wurm and Joel Shapiro was on hand. 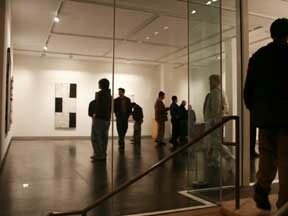 Jerry Iverson's "Nerve Block" show at Pulliam Deffenbaugh gallery... before the crowds descended. 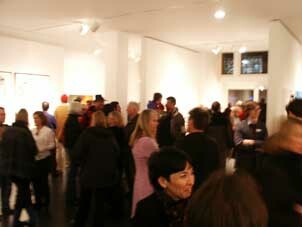 PDX gallery has its first ever First Thursday opening (in the past the gallery was too tiny). 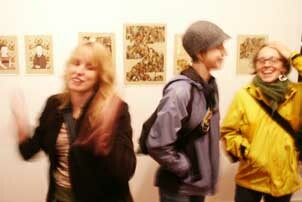 With a group show of all of PDX's artists it was a moshpit of art scene flesh. Did the dignified (but sparky streaked) gallerist Jane Beebe eventually go crowd surfing? 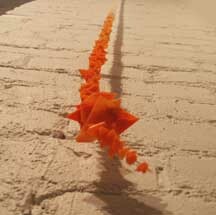 Standout work at PDX was Ellen George's Dreamsicle (detail). 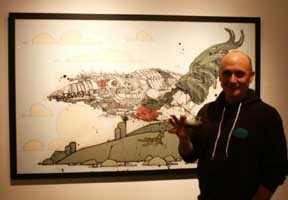 Tom Cramer at his nearly sold out Pearl District Mark Woolley show. He's completely original and wildly popular here in Portland and there is a sea of artists (many who teach) that are terribly envious/spiteful of the man's success. Fair enough, but get over it. Paige Saez at the Pause Gallery in the Everett Station Lofts. 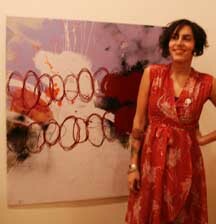 Saez is still developing as a painter but she pulled off a few. 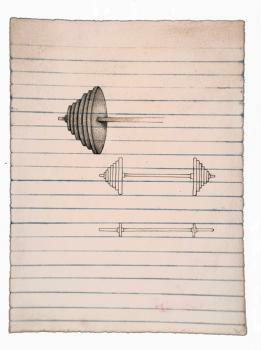 That said, her shiny minimalist vinyl collages are really taking off and in the past Ive really liked her video work. 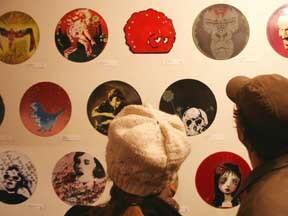 In the Everett Station Lofts, Zeitgeist Gallery's annual Vinyl Killers show was a standout. Tyler Kline's work from Philadelphia (in the top left) made the biggest impression. Angry Fairy Gallery in the Everett Station Lofts. There is a lot of this asian influenced graphic work in Portland but at least it has gotten better recently. 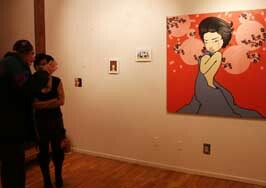 Nearby the Everett Station Lofts in Chinatown at Motel Gallery, Jen Corace's show generated a lively response. I liked its relationship to Richard Dadd's work. 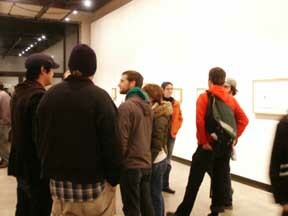 TJ Norris' show at Chambers was closed by the time I got there but I'd seen it earlier. It's one of the best shows the city has seen in months, a breakthrough for Norris. 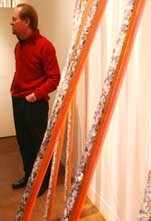 Concert promoter Chris Monlux in front of artwork by Nicholas Di Genova at Gallery 500's closing show. 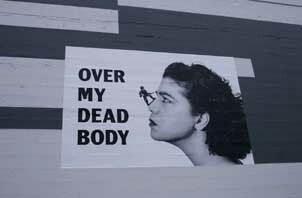 I liked this work but the other artist Troy Briggs was underdeveloped. 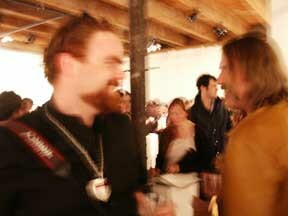 Gallery 500's gallerist Justin Oswald and artist Paul Green... yes things can get this blurry at "G5" and being the last show before Justin's next project only made it blurrier. At small A Projects, before a screening of local filmaker extraordinaire Todd Haynes' "Velvet Goldmine" people took in Josh Mannis' video "Master of the Immortal Arts", which I liked for its Spinal Tap ridiculousness and "bouncy soundtrack"... nothing quite like self-effacing pomposity but it seems like a one hit wonder. The only other work that was interesting (i.e. 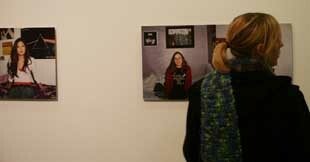 wasn't too precious or formulaic) was Zoe Crosher's very telling before and after photos of new college students. 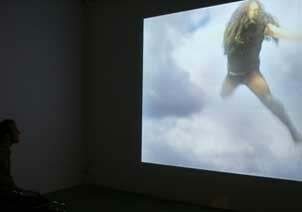 Crosher is a good pick for the gallery's opening show and makes coming of age work that is probing. 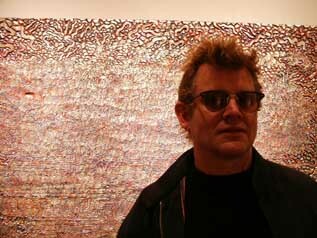 Opening at The New American Art Union with work by Ty Ennis. A lot of Ennis' work tries way too hard to wallow in adolescent self pity or tell jokes about Britney Spears but his use of weightlifting equipment to elicit the, "My Dad is tougher than your Dad" debate was deft and poetic in addition to being funny. Ennis is talented but he should stop leaning on the adolescent pain crutch and go for the universal stuff like the Dad debate. Overall, the energy and quality in town made for interesting rounds despite the mass of group shows which one expects in November. Obviously the "dad" debate is one of the richest and most complex dialogues in contemporary art theory. Despite its inherent broad relevance, I consider it a universal issue due to the undeniable hegemony of one of the participants over all of the others: my dad is the toughest dad in the universe. jeff i appreciate your honesty and look forward to seeing what you write. i cant say i really liked the work i did much at all besides the vinyl pieces, funny how that shows somehow.